In the latest issue of the NFIB Small Business Economic Trends, the headline number for March came in at 101.8, up 0.1 from the previous month. It was also above the Investing.com forecast of 101.3. This was an indication that small businesses continue to power the economy after being briefly shaken by January's government shutdown. Overall, the Index anticipates solid growth, keeping the economy at "full employment" with no signs of a recession in the near term. 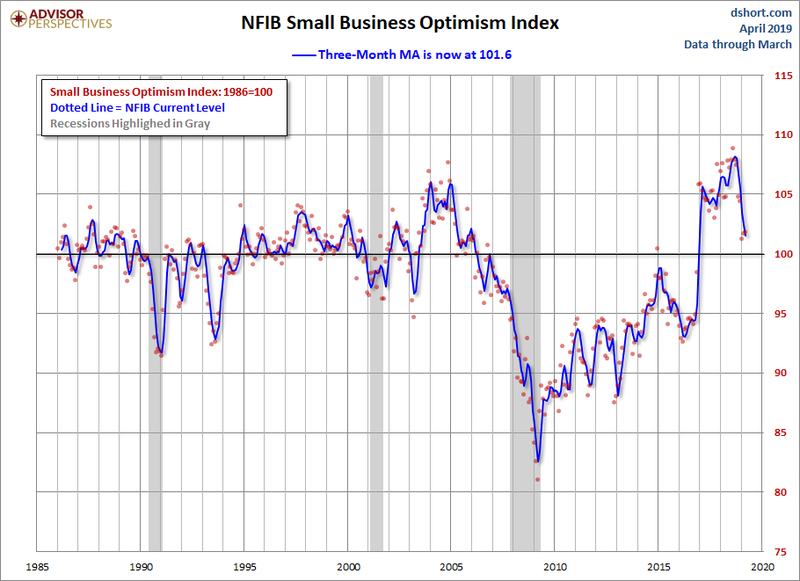 The latest issue of the NFIB Small Business Economic Trends came out on Tuesday morning. The headline number for March came in at 101.8, up 0.1 from the previous month. The index is at the 80th percentile in this series. Today's number came in above the Investing.com forecast of 101.3. 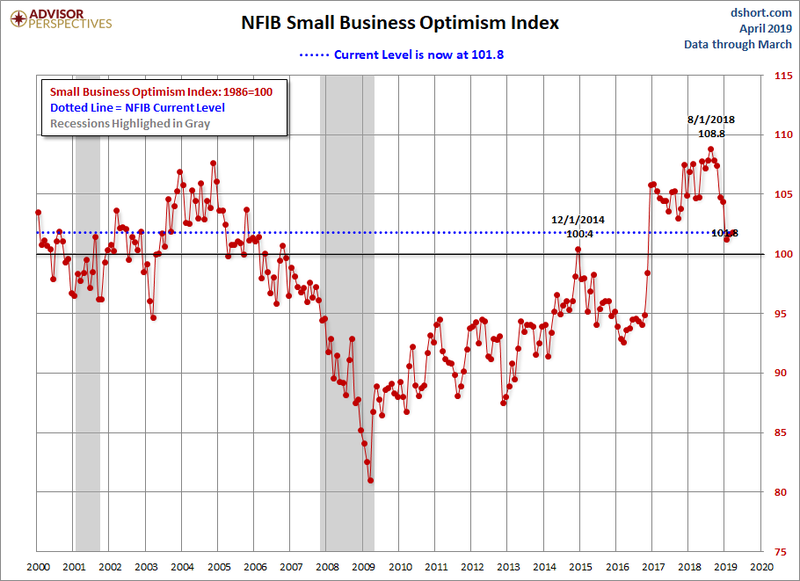 The NFIB Small Business Optimism Index increased 0.1 points to 101.8 in March, a historically strong level and an indication that small businesses continue to power the economy after being briefly shaken by January's government shutdown. Overall, the Index anticipates solid growth, keeping the economy at "full employment" with no signs of a recession in the near term. The Uncertainty Index dropped six points to 79, returning to a more normal level for recent years. "Small business owners continue to create jobs, expand their operations, and are enjoying strong sales," said NFIB President and CEO Juanita Duggan. "Since Congress resolved the shutdown, uncertainty has declined as small business owners add jobs, increase sales, and invest in their businesses and employees." Here is a closer look at the indicator since the turn of the century. The average monthly change in this indicator is 1.3 points. To smooth out the noise of volatility, here is a 3-month moving average of the Optimism Index along with the monthly values, shown as dots. Here are some excerpts from the report. Job creation was solid in March with a net addition of 0.50 workers per firm (including those making no change in employment), close to February's record of 0.52, and up from 0.33 in January. One percent (down 2 points) reported reducing employment an average of 2.4 workers per firm (seasonally adjusted), the lowest percentage of owners reporting reductions in survey history. How effective has the Fed's monetary policy been in lifting inflation to its two percent target rate? he net percent of owners raising average selling prices fell 1 point to a net 12 percent, seasonally adjusted. Firms in construction most frequently reported raising their average prices (a net 29 percent). Seasonally adjusted, a net 24 percent plan price hikes (down 2 points). Has the Fed's zero interest rate policy and quantitative easing had a positive impact on Small Businesses? Three percent of owners reported that all their borrowing needs were not satisfied, unchanged and historically very low. Thirty-three percent reported all credit needs met (down 1 point) and 51 percent said they were not interested in a loan, unchanged. Economic growth hit a small pothole in the first quarter with a government shutdown and bad weather all around. The most recent economic data indicate that the economy is headed back toward stronger growth - retail sales revised up and housing showing some real energy. Capital spending is turning out to be better than first thought. 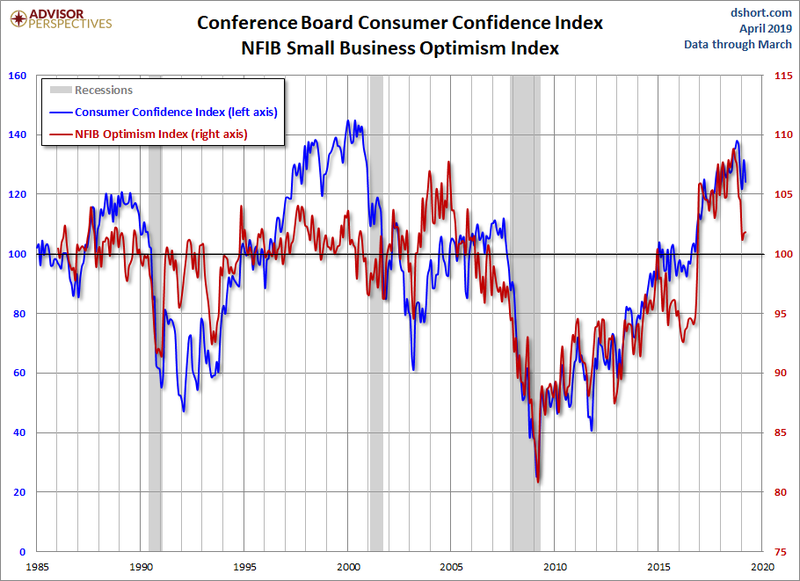 The next chart is an overlay of the Business Optimism Index and the Conference Board Consumer Confidence Index. The consumer measure is the more volatile of the two, so it is plotted on a separate axis to give a better comparison of the two series from the common baseline of 100. These two measures of mood have been highly correlated since the early days of the Great Recession. The two diverged after their previous interim peaks, but have recently resumed their correlation. 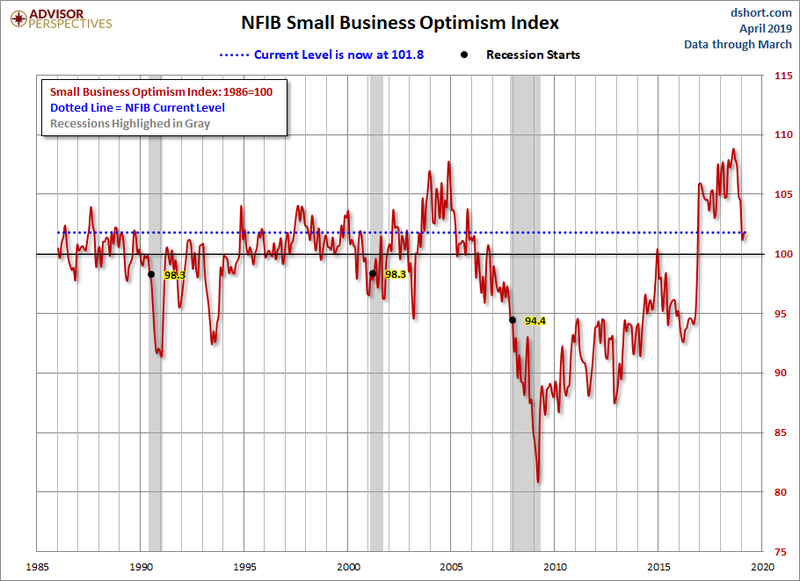 A decline in Small Business Sentiment was a long leading indicator for the last two recessions.